Click the button below to add the Nature's Waterfall Ion Therapy Gemstone Shower Head to your wish list. * Easy Assembly- Bottom of shower head easily screws in to replace shower head in a hand wand shower. If your shower is non-hose/hand wand, it can easily be converted with an affordable, simple to use conversion kit found at most hardware stores or online (From $10-$30). Hand wand showers are nice as you can reach all areas and even great for washing pets. INTERESTING! We consume more in a shower than drinking. Imagine showering in water that is energized, oxygenated, grounding, ionizing, and contains the memory imprint of over 80 plant botanicals and flower essences as well as Gemstone therapy. Now that’s an in-home waterfall! On our happy quest to return as much of our modern synthetic lifestyle back to the benefits of ‘Natural Living,’ we had a look at one of the big ones. OUR SHOWERS. Studies show in a 10 minute shower between breathing the steam and the skin absorption, we ingest more man-made contaminants including chlorine, fluoride and other toxic chemicals than from drinking 8 glasses of the same tap water. With this in mind, it would absolutely make sense to shift our showers back to nature’s flow of beautiful living water. In our natural state, we would be bathing and showering in pure water from creeks and rivers that contained the healthy imprints of the rocks, plants and earth. Our modern showers have strayed far from Nature’s Flow..the water is beat up and laced with a plethora of chemicals. With this nature inspired shower head, the water is once again allowed to flow thru NATURAL filtration, next it flows across special liquid crystal stones as it receives an infrared natural energy infusion of over 80 plant botanicals, flower essences, and gemstone therapy! Additionally, Nature’s negative ions can now be grounding and cleansing our energy fields of the built up stress and toxins and at the same time helping re-balance and refresh us. HAIR: Hair Cuticles left open are a common cause of frizzy hair. Negative ions are notorious for closing the cuticles on the hair, creating a smoother silkier appearance. Notice your hair looking healthier. Too many positive electrons in the physiological current of the human body can cause discomfort and result in disorder of the normal functioning of the body. 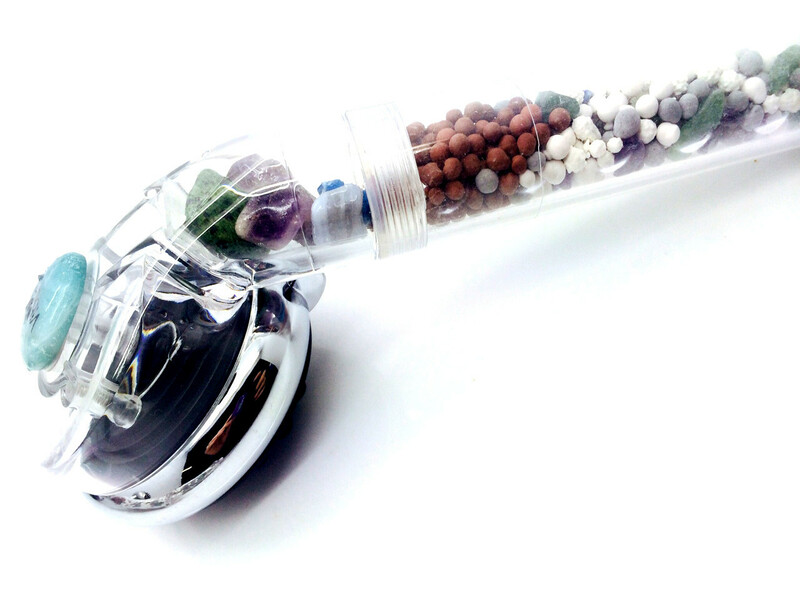 This shower head contains a collection of ingredients known for their powerful abilities in balancing the positive and negative electrons in the human body. Gemstones infused with plant botanicals, essential oils and flower essences in an amplifying liquid crystal formula. Tiny batteries of compressed quartz spheres are embedded into the coating creating over 1 million rays of natural piezo energy per second. We hand make our own patented unique infrared rocks that contain all the ingredients of our earth mats in nature's phi balance, producing the perfect zero-point creation energy. These rocks are oscillating between positive and negative vortex currents, in the same way creeks wind back and forth creating clockwise vortexes for energizing water and counterclockwise for clearing water. The 1 million piezo electric currents per second pass through the nature ingredients picking up the information and imprinting the plants, minerals and gemstones to the memory of the water, as it would naturally be picking up on as it flowed through a creek. Germanium is known for releasing negative electrons to neutralize the positive charges once the temperature is above 89.6 F or 32℃. It is a mineral known for its ability to clean water, even removing toxic odors. It is also recognized for its ability to remove chlorine from water. The far infrared rays of this bead can warm the inner organisms and may also be very helpful in killing germs on our skin. This mineral has a slight electric current. It is known for its abilities to produce both negative ions and infrared rays.